From the developers of the phenomenally successful Euro Truck Simulator, UK Truck Simulator and German Truck Simulator comes Trucks & Trailers! 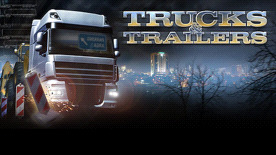 Truck & Trailers puts your driving skills to the ultimate test with over 50 individual truck driving challenges. Compete against the clock to complete intricately designed courses and tasks that put you firmly into the driver's seat. Can you avoid obstacles whilst reversing a trailer? Do you have the lateral thinking required to sort a series of trailers in the yard into their correct positions? Can you park with precision? As your skills increase upgrading the difficultly level will guarantee that there is always a task that will put you and your truck to the ultimate test! At the highest difficulty setting external camera views are disabled, forcing you to manoeuvre like the pro's using only in cab-mirrors. A test that will award you the gold medals and the honour of being a real trucking titan! © 2011 SCS Software. All brand names, trademarks, registered marks, logos, and symbols on vehicles in the game are property of their rightful owners. Used with kind permission.